AMESBURY, MA -- B&S Event Management kicked off the 2017 B&S Open Water Swim Series on Saturday, June 10 with the 4th Annual LandShark Swim. The event welcomed 153 swimmers to Lake Gardner and featured race distances of 1/2 mile, 1 mile, and 2 miles. Balmy weather and a water temperature of 66 degrees made for excellent race conditions. Many New England LMSC athletes made the podium and, after enjoying a post-race breakfast buffet catered by Every Little Breeze Catering, took home a soft-side cooler as a prize. In the 1/2 mile race, Tom Phillips of Greenwood Masters (GWDM) was the overall champion with a time of 14:13.9, while fellow NEMer Bill Tharion placed third. At the 1-mile distance, Ildiko Szekely of Boston University Masters Swimming (BUMS) successfully defended her 2016 title to take the 2017 championship in 25:02.5. David Bentley of Charles River Masters (CRM) was the second overall male finisher. CRM's Katie Levenstein won the women's 20-29 age group, and Katie Dwyer (Unattached) finished second in the 30-39 group. Deborah Sakr of the Granite State Penguins (GSP) won the women's 50-59 age group, while Sweetwater Swim Studio's (SWS) Amy Morin placed third. Anne Verrill (Unattached) grabbed first in the women's 60-69 division ahead of Cathy Utzschneider (Unattached). On the men's side, John Brady of Great Bay Masters (GBM) won the 50-59 age group and Carl Dearmin from YMCA North Shore (YNS) was second. Andover North Andover's (ANA) Frank Maldari was second in for men aged 60-69. Great Bay Masters turned out in force for the 2-mile race, led by Guy Davis. Davis finished first overall in 50:53.6, beating out Chris Borgatti (Unattached) and GBM teammate Ed Gendreau. Kirsten Read won the women's race in 51:07.3, finishing ahead of Erica Carroll (BUMS) and Alana Aubin (CRM). Lauretta Bailin (Unattached) was third in the women's 30-39 age group, while NEM's Thomas Volper won the men's division. In the 40-49 age group, Cindy Regnante and Monica Cohen, both Unattached, were first and second for women, while Jonathan Moore of NEM was second for the men. 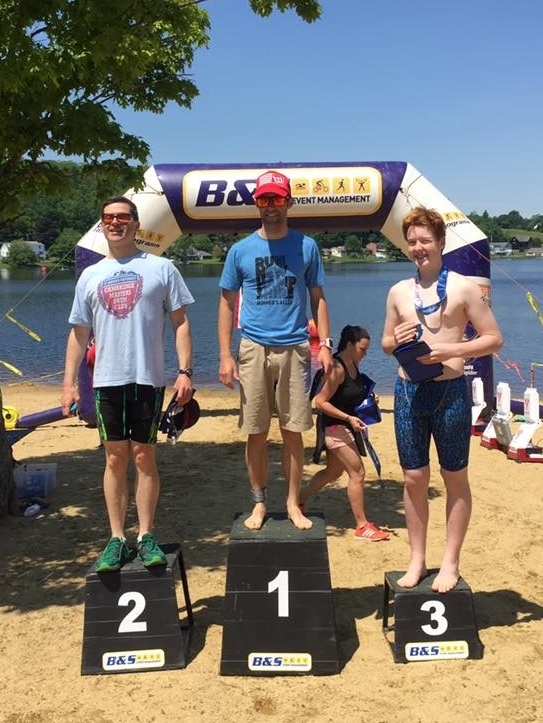 DJ Jenson, of GBM, won the men's 50-59 age group, while Nancy Tunstall from Weymouth Club Masters Swimming (WCMS) and Julie Burnett of Minuteman Aquatics (MAMA) were second and third on the women's side. GBM's Steve Miller was first in the men's 60-69 group, beating out Dave Welch of Andover North Andover (ANA). GBM's Robyn Shiely won the women's 60-69 age group. The B&S Open Water Swim Series continues on June 24 with the 1st Annual Swampscott Harborfest 1/2, 1, and 2 mile races in Swampscott, MA. Photos originally posted on the event's Facebook page.